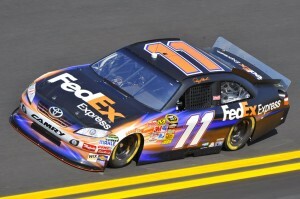 Saturday’s Shootout at Daytona International Speedway will mark Denny Hamlin’s sixth start in the non-points, pre-season exhibition event. Hamlin earned a lifetime invitation into the race with a Shootout victory in his very first try as a rookie in 2006. The Chesterfield, Va., native captured a pole at Phoenix in 2005 — a year he made just seven Cup starts — to gain entry into the 2006 Shootout under the old format, an opportunity he took full advantage of. Driver eligibility for 2011 is based on Chase participants from 2010, past NASCAR Sprint Cup Series champions, former Shootout winners, points race winners at Daytona and Sprint Cup Series ‘Rookie of the Year’ winners from the previous 10 seasons. As the 2006 Shootout winner, 2006 ‘Rookie of the Year’ and a 2010 Chase participant, Hamlin is more than qualified to compete Saturday night. Hamlin finished fifth in the 2010 Shootout, behind winner Kevin Harvick, Kasey Kahne, Jamie McMurray and Joe Gibbs Racing teammate Kyle Busch. It marked his best finish in the event since his 2006 victory. Starting order for Saturday’s event will be determined by a blind draw Friday night, with Hamlin’s best “qualifying effort” of fifth coming in 2009. He started 24th one year ago. Hamlin has led a total of 20 laps in Shootout competition — 16 in 2006 and four in 2009. What are your thoughts heading into the Shootout? What is your outlook for the 2011 season? Are you the driver to unseat Jimmie Johnson this year? How do you feel about the new points system? Does the new points system change your strategy? How do you put last year behind you to focus on 2011?